Overall: a good collection, I’d say, although perhaps not really representative of Fisk’s strengths and weaknesses at novel length — perhaps less representative than I expected, at any rate, given that his novels tend to be on the short side anyway. The stories are more about childhood situations, or situations that can be read as representative of childhood situations, and less about children themselves; and they tend more towards outright horror or comedy. In googling around for references to the stories in this volume I discovered that Fisk has actually published another collection, Living Fire and Other Stories, and that one of his stories was nominated for a Nebula in 1976. So I don’t think I’m quite done with Fisk’s short fiction yet. In the meantime, however, here are links to all the story posts. 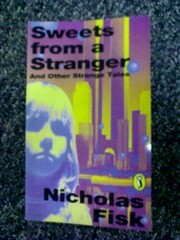 There’s some discussion on the “Sweets for a Stranger” post, if anyone hasn’t seen it.